"Born and bred in the West, Judge Brand had never quite reconciled himself to the East." 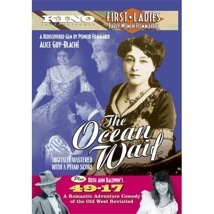 This disc comprises the third entry in Kino�s �First Ladies: Early Women Filmmakers� series, and it gathers two films, Alice Guy-Blache�s The Ocean Waif and Ruth-Ann Baldwin�s 49-17. This series transitioned from VHS to DVD, so if you own the previous tapes and want to upgrade, here�s your chance; likewise, those who want to see some unheralded filmmakers from cinema�s early days may wish to take a look. French director Alice Guy-Blache got her start in her homeland working for the Gaumont studio, where she made numerous works; one source lists her as being involved in some capacity in more than 700 films. Those interested in her work can find a French R2 box set of early Gaumont silents which dedicates an entire disc to her work. Marriage brought her to America, where she began working for Gaumont�s American branch, before leaving to form her own filmmaking company, the first woman to do so. Largely forgotten since her heyday, Guy-Blache was obviously a trailblazer among women in the cinema. All that said, it�s unfortunate that the work presented here is so uneven and awkward. The Ocean Waif survives only in what is a fairly brutalized print, shorn of several scenes and suffering from decomposition damage to boot. The story is a fairly mundane melodrama about the title character, Millie (Doris Kenyon), who flees from her brutal father and meets Ronald (Carlyle Blackwell), a famous writer who has arrived in the area to hammer out his next opus. Complications ensue, but true love, such as it is, triumphs. Given the film�s incomplete state, it�s difficult to say what is simply bad writing and what fails due to footage long missing. It�s a pleasant enough film, though nothing ground-breaking. To be honest, I was more interested in Guy-Blache herself than her work after sitting through this, and a documentary about her would have sweetened this package considerably. The other item here is 49-17, which is not a football score, but instead an oddball Western comedy of sorts. Wealthy judge Brand (Joseph Girard) yearns for the days of his youth back in the gold rush period, so he sends a man out West to purchase a ghost town and populate it with people willing to act as they did in the olden days. It�s just the sort of thing rich folk do. Anyway, a Wild West troupe agree to live in the town, and hijinks ensue, with an unexpected twist thrown in. This is more entertaining than Guy-Blache�s film, but only due to the relatively weakness of the latter than the strength of the former. It�s a diverting piece though, and demonstrates how ingrained the idea of the West was and how it was portrayed. Image Transfer Review: The transfers themselves are fine enough, but it is the condition of the prints that present real problems here. Certainly it isn't Kino's fault that The Ocean Waif had fallen into a state of near total loss in spots, but it does make the film difficult to watch, given the numerous faults present. Again, as with many films of this period, we're just lucky to have them at all. 49-17 fared much better against the ravages of time and decomposition, with fairly minor damage to go with its nicely tinted print. Audio Transfer Review: The piano scores by Jon Mirsalis are pleasing and well-recorded, accentuating the films nicely. Extras Review: None, which in the case of such an interesting figure as Guy-Blache, is too bad. Of interest primarily to silent fans and scholars of women in film, the two films here are no great shakes but provide reasonable entertainment value. The presentation is bare bones.